This Schmincke Horadam Watercolour Set includes twelve high-quality German-made half pan watercolours and comes in a beautiful brown leather case for storage and protection. 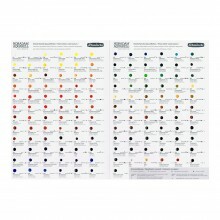 These professional grade watercolours are vibrant and rich, as well as being fully reusable when dried on a palette. Perfect as a gift, this set is accompanied by Schmincke's Brown Leather case - high-quality, sturdy and beautifully designed. It fastens with a brown leather chord. This set includes Half Pans in the following colours: Cadmium Yellow Light, Transparent Orange, Scarlet Red, Magenta, Ultramarine Finest, Helio Cerulean, Payne's Grey Blueish, Permanent Green Olive, Sepia Brown, Perylene Violet, Burnt Sienna, Quinacridone Gold Hue.